Understand your Bible better while deepening your relationship with your Heavenly Abba (Father) and growing in love for His people Israel. 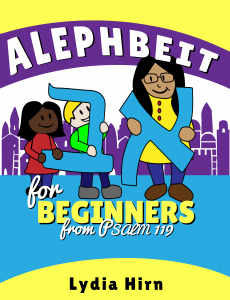 This simple, easy-to-use workbook uses Psalm 119 to teach the Hebrew Alephbeit to children while also teaching modern Hebrew vocabulary. Straightforward pronunciation and usage tips are included, as well as plenty of review so that sounds and words won’t be forgotten. Students will be given the opportunity to use their creativity with each lesson, helping to lock in the meaning and sounds of each Hebrew letter. This book was written for children, but the parents who tested it were unanimous that it works great for adults, too! Learn how to pronounce and write the Hebrew consonants. Learn what each Hebrew letter represents. Use Psalm 119 to practice identifying the Hebrew letters and copying Hebrew verses. Memorize 135 Modern Hebrew vocabulary words that can be used right away in daily life. Reinforce what you have learned with fun exercises and quizzes. Review with included flashcards and vocabulary word lists. Note: This book opens from the right, which is the opposite of English books. This is not an error in printing. We want to help your children learn how all traditional Hebrew books work. Lydia Hirn, author and blogger, is a homechooling graduate from Michigan and is sister to 14 siblings. 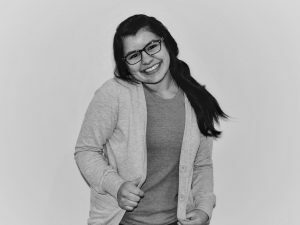 She is experienced with children’s evangelism outreach, worship and song writing, and photography. She has a love for Israel and for Scripture study and copywork, especially in Hebrew, the original language of the Bible. Visit her at Lydia Lu Languages for encouraging blog posts, language-learning videos and audios, and of course, her Hebrew curriculum books and other products. Book 3 will be a reading-your-Hebrew-Bible study/help book. You’ll learn how to read, study, AND understand what you’re actually reading. Book 4 will be a Modern Hebrew book. You will learn how to speak fluently and have conversations in Hebrew. By the time you’ve gone through this series, you will be able to read and understand the majority of your Hebrew Bible with little help. You will also be able to have conversations in Hebrew and speak fluently enough that you will be able to communicate in Israel if needed. *Note* Lydia Hirn will be posting weekly videos at Lydia Lu Languages of the correct pronunciation of all the Hebrew words you learn in each book.